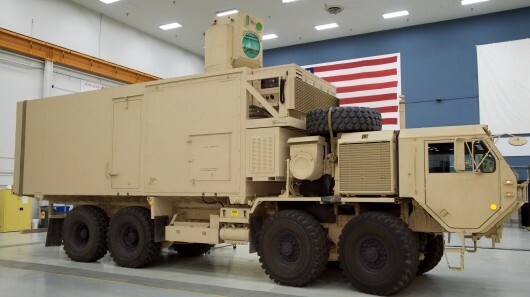 There are solid-state high-energy lasers already being tested on the sea and in the air, now Boeing is continuing development of a truck-mounted system. The system is similar in concept to Boeing’s Laser Avenger that is intended for combating unmanned aerial vehicles (UAVs), but boasts a more powerful laser for countering a wider variety of threats, including rockets, artillery, mortars, as well as UAVs. In 2009, testing of the Laser Avenger used a 1-kilowatt, solid-state laser system mounted on an Avenger ground combat vehicle. But this truck-mounted system will use a 10-kilowatt, solid-state laser incorporated with the High Energy Laser Mobile Demonstrator (HEL MD) system, with an even more powerful laser to be used in the future according to Boeing. The HEL MD program will now enter Phase II high-power testing as part of a follow-on contract that supports development and testing for the next three years. This is a joint development effort between Boeing and the U.S. Army Space and Missile Defense Command (SMDC).